This article is about the whole franchise. For the film, see Jurassic Park (film). For the novel by Michael Crichton, see Jurassic Park (novel). For other uses, see Jurassic Park (disambiguation). Jurassic Park is an American science fiction media franchise centered on a disastrous attempt to create a theme park of cloned dinosaurs. It began in 1990 when Universal Pictures and Amblin Entertainment bought the rights to the novel by Michael Crichton before it was even published. Original film series logo, depicting the skeleton of a Tyrannosaurus rex. The book was successful, as was Steven Spielberg's 1993 film adaptation, which led to four sequels, although only the first two films were based on the novels. Numerous video games based on the franchise have been created by various software developers since the release of the 1993 film. Since 1996, several water rides based on the series have been opened at various Universal theme parks. The Jurassic Park Ultimate Trilogy was released on DVD and Blu-ray on October 25, 2011, in North America. The first film was re-released in 3D on April 5, 2013. The fourth film, Jurassic World, was initially scheduled to be released in the summer of 2005, but was delayed numerous times and was ultimately released in June 2015. It became the first film to gross over $500 million worldwide in its opening weekend, and grossed over $1.6 billion through the course of its theatrical run, making it the fifth highest-grossing film of all time. It was also the second highest-grossing film of 2015. When adjusted for monetary inflation, this film is the second highest grossing in the franchise after Jurassic Park. An animated film, Lego Jurassic World: The Indominus Escape, was released in October 2016 with the home media release of Jurassic World, alongside a short film, Employee Safety Video. Two other interactive Lego short films, Lego Jurassic World: Rescue Blue/Escape the Indoraptor, were also released in 2018, followed by an animated special, Lego Jurassic World: The Secret Exhibit, which aired on NBC later that year. A fifth film, Jurassic World: Fallen Kingdom, was released in June 2018. The film grossed over $1.3 billion worldwide, making it the third Jurassic film to pass the billion dollar mark. It is the third highest-grossing film of 2018 and the 12th highest-grossing film of all time. A sixth film, tentatively titled Jurassic World 3, is scheduled to be released on June 11, 2021. As of 2000, the franchise had generated $5 billion in revenue, making it one of the highest-grossing media franchises of all time. In 2018, the first film was selected for preservation in the United States National Film Registry by the Library of Congress as being "culturally, historically, or aesthetically significant." "inGen" redirects here. For other uses, see ingen (disambiguation). InGen company logo in the film series. International Genetic Technologies, Inc. (InGen) is a fictional company based in Palo Alto, California and has one location in Europe. [nb 1] Nevertheless, most of InGen's research took place on the fictional islands of Isla Sorna and Isla Nublar, near Costa Rica. [nb 1][nb 2] While the first novel indicated InGen was just one of any number of small 1980s genetic engineering start-ups, the events of the novel and film revealed to a select group that InGen had discovered a method of cloning dinosaurs and other animals (including a quagga) using blood extracted from mosquitoes trapped in amber during various periods in time, ranging from the Mesozoic era to the 1800s. [nb 1] Beacham's Encyclopedia of Popular Fiction describes InGen as comparable to another "sleazy organization". Other sources reference the company's receiving the baby T. rex as an allusion to other exploitative entrepreneurs depicted in King Kong. Ken Gelder describes InGen as "resolutely secretive, just like the firm in Grisham's novel". Cover of Michael Crichton's Jurassic World, two novels (Jurassic Park & The Lost World) compiled as one set. 1917 skeletal diagram of Tyrannosaurus published by Henry Fairfield Osborn, which was the basis of the covers of Jurassic Park and The Lost World, and subsequently the logo of the movies. In 1983, Michael Crichton originally conceived a screenplay about a pterosaur being cloned from fossil DNA. After wrestling with this idea for a while, he came up with the story of Jurassic Park. Crichton worked on the book for several years; he decided his first draft would have a theme park for the setting (similar to his 1973 film Westworld) and a young boy as the main character. Response was extremely negative, so Crichton rewrote the story to make it from an adult's point of view, which resulted in more positive feedback. Steven Spielberg learned of the novel in October 1989 while he and Crichton were discussing a screenplay that would become the TV series ER. Warner Bros. Pictures, Columbia Pictures, 20th Century Fox, and Universal Pictures bid for the rights to the novel before its publication. In May 1990, Universal acquired the rights, with the backing of Spielberg's Amblin Entertainment. Crichton put up a non-negotiable fee for $1.5 million as well as a substantial percentage of the gross. Universal further paid Crichton $500,000 to adapt his own novel (Malia Scotch Marmo, who was a writer on Spielberg's 1991 film Hook, wrote the next draft of Jurassic Park, but was not credited. David Koepp wrote the final draft, which left out much of the novel's exposition and violence, and made numerous changes to the characters). Universal desperately needed money to keep their company alive, and partially succeeded with Jurassic Park, as it became a critical and commercial success. After the film adaptation of Jurassic Park was released to home video, Crichton was pressured from many sources for a sequel novel. Crichton declined all offers until Spielberg himself told him that he would be keen to direct a movie adaptation of the sequel, if one were written. Crichton began work almost immediately and in 1995 published The Lost World. Crichton confirmed that his novel had elements taken from the novel of the same name by Sir Arthur Conan Doyle. The book was also an outstanding success, both with professional and amateur critics. The film adaptation, The Lost World: Jurassic Park, began production in September 1996. In 2001, Scott Ciencin wrote a trilogy of spin-off novels based upon Jurassic Park III. The series contained Jurassic Park Adventures: Survivor, Jurassic Park Adventures: Prey, and Jurassic Park Adventures: Flyers. The Evolution of Claire (Jurassic World) is a young adult novel written by Tess Sharpe. It is based upon the Jurassic World trilogy, and was released in 2018 in conjunction with the release of Jurassic World: Fallen Kingdom. It is set in 2004, prior to the opening of the Jurassic World theme park. The novel is about college freshman Claire Dearing during her summer internship at the park. June 22, 2018 (2018-06-22) J. A. Theatrical poster for the 3D re-release of Jurassic Park. John Hammond is the owner of Jurassic Park, a theme park located on Isla Nublar. When an incident with a velociraptor results in the death of an employee, Hammond (Richard Attenborough) brings in three specialists to sign off on the park to calm investors. 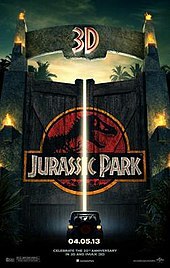 The specialists, paleontologist Alan Grant (Sam Neill), paleobotanist Ellie Sattler (Laura Dern), and chaos theorist Ian Malcolm (Jeff Goldblum) are surprised to see the island park's main attraction are living, breathing dinosaurs, created with a mixture of fossilized DNA and genetic cross-breeding/cloning. When lead programmer Dennis Nedry (Wayne Knight) shuts down the park's power to sneak out with samples of the dinosaur embryos to sell to a corporate rival, the dinosaurs break free, and the survivors are forced to find a way to turn the power back on and make it out alive. The film also stars Bob Peck, Martin Ferrero, BD Wong, Ariana Richards, Joseph Mazzello, and Samuel L. Jackson. Jurassic Park is regarded as a landmark in the use of computer-generated imagery and received positive reviews from critics, who praised the effects, though reactions to other elements of the picture, such as character development, were mixed. During its release, the film grossed more than $914 million worldwide, becoming the most successful film released up to that time (surpassing E.T. the Extra-Terrestrial and surpassed 4 years later by Titanic), and it is currently the 17th highest grossing feature film (taking inflation into account, it is the 20th-highest-grossing film in North America). It is the most financially successful film for NBCUniversal and Steven Spielberg. Jurassic Park had two re-releases: The first on September 23, 2011, in the United Kingdom and the second in which it was converted into 3D on April 5, 2013, for its 20th Anniversary, which resulted in the film passing the $1 billion mark at the worldwide box office. Before The Lost World was published, a film adaptation was already in pre-production, with its release occurring in May 1997. The film was a commercial success, breaking many box-office records when released. The film had mixed reviews, similar to its predecessor in terms of characterization. Much like the first film, The Lost World made a number of changes to the plot and characters from the book, replacing the corporate rivals with an internal power struggle and changing the roles or characterizations of several protagonists. When a vacationing family stumbles upon the dinosaurs of Isla Sorna, a secondary island where the animals were bred en masse and allowed to grow before being transported to the park, Ian Malcolm (Jeff Goldblum) is called in by John Hammond (Richard Attenborough) to lead a team to document the island to turn it into a preserve, where the animals can roam free without interference from the outside world. Malcolm agrees to go when he discovers his girlfriend, paleontologist Sarah Harding (Julianne Moore) is already on the island, while at the same time Hammond's nephew, Peter Ludlow (Arliss Howard), has taken over his uncle's company and leads a team of hunters to capture the creatures and bring them back to a theme park in San Diego. The two groups clash and are ultimately forced to work together to evade the predatory creatures and survive the second island. The film also stars Pete Postlethwaite, Richard Schiff, Vince Vaughn, Vanessa Lee Chester, Peter Stormare, and a young Camilla Belle. Joe Johnston had been interested in directing the sequel to Jurassic Park and approached his friend Steven Spielberg about the project. While Spielberg wanted to direct the first sequel, he agreed that if there was ever a third film, Johnston could direct. Spielberg, nevertheless, stayed involved in this film by becoming its executive producer. Production began on August 30, 2000, with filming in California, and the Hawaiian islands of Kauai, Oahu, and Molokai. It is the first Jurassic Park film not to be based on a novel. The film was a financial success but received mixed reviews from critics. When their son goes missing while parasailing at Isla Sorna, the Kirbys (William H. Macy and Téa Leoni) hire Alan Grant (Sam Neill) under false pretenses to help them navigate the island. Believing it to be nothing more than sight-seeing, and that he will act as a dinosaur guide from the safety of their plane, he is startled to find them landing on the ground, where they are stalked by a Spinosaurus (superior to the Tyrannosaurus in size), which destroys their plane. As they search for the Kirbys' son, the situation grows dire as Velociraptors hunt their group and they must find a way off the island. The film also stars Alessandro Nivola, Michael Jeter, Trevor Morgan, Mark Harelik, and Laura Dern. The Jurassic World trilogy logo. Steven Spielberg devised a story idea for a fourth film in 2001, during production of Jurassic Park III. In 2002, William Monahan was hired to write the script, with the film's release scheduled for 2005. Monahan finished the first draft of the script in 2003, with the film's plot revolving around dinosaurs escaping to the mainland. Sam Neill and Richard Attenborough were set to reprise their characters, while Keira Knightley was in talks for two separate roles. In 2004, John Sayles wrote two drafts of the script. Sayles' first draft involved a team of Deinonychus being trained for use in rescue missions. His second draft involved genetically modified dinosaur-human mercenaries. Both drafts were scrapped. In 2006, a new script was being worked on. Laura Dern was contacted to reprise her role, with the film expected for release in 2008. The film was further delayed by the 2007–08 Writers Guild of America strike. Mark Protosevich wrote two film treatments in 2011, which were rejected. Rise of the Planet of the Apes screenwriters Rick Jaffa and Amanda Silver were hired in 2012 to write an early draft of the script. In 2013, Colin Trevorrow was announced as a director and co-writer, with the film scheduled for release on June 12, 2015. The film was shot in 3D, and received generally positive reviews. The film features a new park, Jurassic World, built on the remains of the original park on Isla Nublar. The film sees the park run by Simon Masrani (Irrfan Khan) and Masrani Corp, and features the return of Dr. Henry Wu (BD Wong) from the first film. Chris Pratt, Bryce Dallas Howard, and Jake Johnson star, while Vincent D'Onofrio portrayed the main antagonist, Vic Hoskins. The cast also includes Lauren Lapkus, Ty Simpkins, Nick Robinson, Omar Sy, and Judy Greer. The primary dinosaur antagonist is Indominus rex, a genetically-modified hybrid of Tyrannosaurus rex and several other species, including Velociraptor, cuttlefish, tree frog, and pit viper. A sequel to Jurassic World was released on June 22, 2018. The film was directed by J. A. Bayona and written by Trevorrow and Connolly, with Trevorrow and Spielberg as executive producers. The film stars Chris Pratt, Bryce Dallas Howard, Rafe Spall, Justice Smith, Daniella Pineda, James Cromwell, Toby Jones, Ted Levine, BD Wong, Isabella Sermon, and Geraldine Chaplin, with Jeff Goldblum reprising his role as Dr. Ian Malcolm. During early conversations on Jurassic World, Spielberg told Trevorrow that he was interested in having several more films made. In April 2014, Trevorrow announced that sequels to Jurassic World had been discussed: "We wanted to create something that would be a little bit less arbitrary and episodic, and something that could potentially arc into a series that would feel like a complete story." Trevorrow, who said he would direct the film if asked, later told Spielberg that he would only focus on directing one film in the series. Trevorrow believed that different directors could bring different qualities to future films. Bayona was once considered to direct Jurassic World, but he declined as he felt there was not enough time for production. Filming took place from February to July 2017, in the United Kingdom and Hawaii. Former Jurassic World manager Claire Dearing and Velociraptor handler Owen Grady join a mission to rescue Isla Nublar's dinosaurs from a volcanic eruption by relocating them to a new island sanctuary. They discover that the mission is part of a scheme to sell the captured dinosaurs on the black market in order to fund his party's genetic research. The captured dinosaurs are brought to an estate in northern California, where several of the creatures are auctioned and subsequently shipped to their new owners. A new hybrid dinosaur, the Indoraptor, escapes and terrorizes people at the estate before being killed. The unsold dinosaurs are released from the estate and into the wilderness to save them from a gas leak. With the dinosaurs now dispersed, the world has entered a Neo-Jurassic Period where humans and dinosaurs must coexist. A subplot involving human cloning is introduced, and the development of exploiting the dinosaurs' abilities for militaristic applications and other uses is re-explored. In September 2015, Trevorrow said that Bryce Dallas Howard's character would evolve the most over the course of the Jurassic World trilogy. In October 2015, Frank Marshall confirmed plans for a sixth film in the series. In November 2015, Universal Pictures chairman Donna Langley said that Trevorrow and Spielberg have a story idea for the sixth film. In September 2016, Bayona further confirmed that Trevorrow has plans for a Jurassic World trilogy. That month, Trevorrow was asked how much planning he had put into a new trilogy while he was filming Jurassic World in 2014: "I knew the end. I knew where I wanted it to go." Trevorrow later said that planning the beginning, middle, and end of the trilogy ahead of time "is crucial to a franchise like this if you really want to bring people along with you and make sure they stay interested. It needs to be thought through on that level. It can't be arbitrary [...] the earlier Jurassic Park movies had pretty clear definitive endings. They were much more episodic." In March 2017, Laura Dern commented, "As I said to the people who are making the new series, 'If you guys make a last one, you gotta let Ellie Sattler come back.'" In February 2018, it was announced that the film, temporarily titled Jurassic World 3, would be released on June 11, 2021. It was also announced that Trevorrow would write the script with Emily Carmichael, based on a story by Trevorrow and Connolly; and that Trevorrow and Spielberg would serve as executive producers for the film, with Marshall and Crowley as producers. On March 30, 2018, it was announced that Trevorrow would also direct the film, at the request of Spielberg. Trevorrow met Carmichael after seeing a short film of hers, and said, "I just knew immediately that I loved her brain." Trevorrow was subsequently impressed with Carmichael's writing work on Pacific Rim Uprising and a remake of The Black Hole, leading him to choose her as a co-writer for Jurassic World 3. Trevorrow and Carmichael were writing the script as of April 2018. At the time, Trevorrow said that Pratt and Howard would reprise their roles from the previous films, and that there were other characters in Fallen Kingdom who "you'll realize are major characters." Additionally, Trevorrow said that Jurassic World 3 would be a "science thriller," describing it as being the Jurassic World film that would most closely match the tone of Spielberg's original 1993 Jurassic Park film. In May 2018, Trevorrow announced that the film would focus more on real dinosaurs as opposed to hybrids, which had prominent roles in the previous Jurassic World films. In June 2018, Trevorrow stated that the film would focus on the dinosaurs that went open source after being sold and spread around the world in Jurassic World: Fallen Kingdom, allowing people other than Dr. Henry Wu to create their own dinosaurs. Trevorrow stated that the film would be set around the world, and said that the idea of Henry Wu being the only person who knows how to create a dinosaur was far-fetched "after 30 years of this technology existing" within the films' universe. Additionally, the film would focus on the dinosaurs that were freed at the end of Jurassic World: Fallen Kingdom, but it would not depict dinosaurs terrorizing cities and going to war against humans; Trevorrow considered such ideas unrealistic. Instead, Trevorrow was interested in a world where "a dinosaur might run out in front of your car on a foggy backroad, or invade your campground looking for food. A world where dinosaur interaction is unlikely but possible—the same way we watch out for bears or sharks." Trevorrow said that the film would also be about Owen and Claire's responsibility to take care of Maisie, a cloned girl from the previous film. Certain scenes and ideas regarding the integration of dinosaurs into the world were ultimately removed from the Jurassic World: Fallen Kingdom script to be saved for the third film. Trevorrow said about the realism of the film's story, "I think any kind of global acceptance that [dinosaurs] are just around doesn't feel real to me because, even now when you think of animals, when was the last time you saw a tiger walking down the street? We know there are tigers. We know they're out there. But to me, it's very important that we keep this grounded in the context of our relationship with wild animals today." Howard stated that she wanted the film to "blow your mind in terms of being like, 'Whoa, this is where this technology can go. This is what the world could really turn into if this technology fell into the wrong hands.' So basically seeing a world with dinosaurs everywhere." A very first live-action short film, which will include Nasutoceratops and Allosaurus, will accompany the theatrical release of Universal's Hobbs & Shaw, scheduled for release in August 2019. Cover of the home media release of Jurassic World / Lego Jurassic World 2-Pack, containing The Indominus Escape and Employee Safety Video. Over the course of five days from October 3, 2016 to October 7, 2016, an untitled five-part animated series based on Lego Jurassic World was released on the YouTube channels of Jurassic World and LEGO. In October 2016, the series was released as a 24-minute animated film entitled Lego Jurassic World: The Indominus Escape as part of a Jurassic World DVD bundle set, receiving shared billing alongside the 2015 film. The film marks the first time an animated film spin-off of Jurassic Park has been released. The film is a prequel to Jurassic World, and features most of the primary adult characters on the island (with the exception of Barry and Zara) attempting to capture a hotdog-loving Indominus rex. Zachary Levi, Sendhil Ramamurthy and Fred Tatasciore joined Jake Johnson, Lauren Lapkus, Bryce Dallas Howard and BD Wong as voice actors. The film is directed by Michael D. Black. With the home media release of The Indominus Escape, a short film was released, featuring BD Wong, David Gunning, Jake Johnson and Lauren Lapkus reprising their roles from The Indominus Escape. Like The Indominus Escape, the short is set before the events of Jurassic World. In promotion of Jurassic World: Fallen Kingdom, Lego produced two short films titled Rescue Blue and Escape the Indoraptor, with a variant featured on YouTube where it was separated into four parts, and at the end of each part the audience was given the option to choose between two different outcomes. On November 29, 2018, NBC aired a new animated special, Lego Jurassic World: The Secret Exhibit, as a prequel to Jurassic World. The special received low ratings with 1.8 million viewers. It is scheduled for DVD release on January 19, 2019. In February 2019, Lego announced plans for a 13-episode animated miniseries titled Lego Jurassic World: Legend of Isla Nublar, scheduled for release later in the year. The series would be based on the Jurassic World films and would feature Owen and Claire, who deal with various issues at the Jurassic World theme park, including tourists, escaped dinosaurs, ongoing expansion of the park, and unpredictable weather. In addition, the premise would involve a park saboteur, Dennis Nedry's nephew, searching Isla Nublar in search of a treasure, while wearing a dinosaur mech suit. The series is a prequel to Jurassic World, set three years prior and following the events of Lego Jurassic World: The Secret Exhibit. Lego would also produce a line of Lego toy sets as a tie-in to the series. This section shows characters who will appear or have appeared in more than two films in the series. V indicates a voice-only role. From June 1993 to August 1997 the now-defunct Topps Comics published comic adaptations of Jurassic Park and The Lost World: Jurassic Park, as well as several tie-in series. Jurassic Park #0–4 (June–September 1993). Adaptation of the film, adapted by Walter Simonson and pencilled by Gil Kane. Each issue had two covers – a main cover by Gil Kane, with the variant by Dave Cockrum. Issue #0 features two prequel stories to the film, and was only available with the trade paperback of the film adaptation. Jurassic Park: Raptor #1–2 (November–December 1993). Written by Steve Englehart and pencilled by Armando Gil and Dell Barras. Jurassic Park: Raptors Attack #1–4 (March–June 1994). Written by Steve Englehart, pencilled by Armando Gil (#1) and Chaz Truog, with covers by Michael Golden. Jurassic Park: Raptors Hijack #1–4 (July–October 1994). Written by Steve Englehart, pencilled by Neil Vokes, with covers by Michael Golden. Jurassic Park: Annual #1 (May 1995). Featuring two stories, one being a sequel and one being a prequel. Written by Bob Almond, Michael Golden and Renée Witterstaetter, pencilled by Claude St. Aubin and Ed Murr, with a cover by Michael Golden. Return to Jurassic Park #1–9 (April 1995 – February 1996). Ongoing series. The first four issues were written by Steve Englehart and pencilled by Joe Staton. The next four issues were written by Tom Bierbaum and Mary Bierbaum, being drawn by Armando Gil. The first 8 issues had covers by Michael Golden. The ninth and final issue was a jam book[clarification needed] written by Keith Giffen and Dwight Jon Zimmerman, featuring artwork by such acclaimed artists as Jason Pearson, Adam Hughes, Paul Gulacy, John Byrne, Kevin Maguire, Mike Zeck, George Pérez and Paul Chadwick, with a cover by John Bolton. The Lost World: Jurassic Park #1–4 (May–August 1997). Adaptation of the second film. Adapted by Don McGregor and pencilled by Jeff Butler (#1–2) and Claude St. Aubin (#3–4). Each issue of the series featured two covers – one by Walter Simonson and a photo cover. Beginning in June 2010, IDW Publishing began publishing Jurassic Park comics. They also acquired the rights to reprint the issues published by Topps in the 1990s, which they began to do in trade paperback format starting in November 2010. After a four-year hiatus, IDW announced a comic series based on Jurassic World that was to be released in 2017. Jurassic Park: Redemption #1–5 (June 2010 – October 2010). Five-issue series written by Bob Schreck with art by Nate van Dyke. Each issue has a main cover penciled by Tom Yeates, with variant covers by Frank Miller, Arthur Adams, Paul Pope, Bernie Wrightson, and Bill Stout, respectively. Jurassic Park: The Devils in the Desert #1–4 (January 2011 – April 2011). Four-issue series written and illustrated by John Byrne. Jurassic Park: Dangerous Games #1–5 (September 2011 – January 2012). Five-issue series written by Greg Bear and Erik Bear, with art by Jorge Jiménez and a variant cover by Geof Darrow. In June 1993, after the theatrical release of Jurassic Park, spokesmen for Amblin and MCA confirmed that an animated series based on the film was in development and awaiting Spielberg's final approval. The series, titled Escape from Jurassic Park, would have consisted of 23 episodes for its first season. The series would have centered on John Hammond's attempts to finish Jurassic Park and open it to the public, while InGen's corporate rival Biosyn is simultaneously planning to open their own dinosaur theme park in Brazil, which ultimately ends with their dinosaurs escaping into the jungles. If produced, it was believed that the project would be the most expensive animated series up to that time. Jeff Segal, president of Universal Cartoon Studios, said, "We are developing a TV series that we anticipate would be computer animated and very sophisticated. However, Spielberg has not had a chance yet to look at either the material or the format for the series." Segal said Universal was considering the possibility of developing the series for prime time. Segal said about the series' storyline, "It would essentially pick up from the closing moments of the movie and it would continue the story in a very dramatic way. The intention would be to continue with the primary characters and also introduce new characters." Segal also said the series would be aimed specifically at the same target audience as the film, while hoping that it would also appeal to young children. Animation veteran and comic artist Will Meugniot (then working at Universal Cartoon Studios for various projects, including Exosquad) contacted artist William Stout to ask if he would be interested in designing the animated series. According to Stout, "This was not going to be a kiddy show (although kids of all ages, including myself, could enjoy it). They wanted the show to be a mature prime time series with top writers and state-of-the-art television animation augmented with quite a bit of CG animation." Universal Animation Studios wanted the show to have the look of a graphic novel. Stout was hired to work on the series and subsequently made a trailer to demonstrate how the series would look, and how it would combine traditional animation with computer animation. The series required Spielberg's final approval before it could go into production. However, Spielberg had grown tired of the massive promotion and merchandise revolving around the film, and never watched the trailer. On July 13, 1993, Margaret Loesch, president of the Fox Children's Network, confirmed that discussions had been held with Spielberg about an animated version of the film. Loesch also said, "At least for now and in the foreseeable future, there will not be an animated Jurassic Park. That's Steven Spielberg's decision, and we respect that decision." Part three of the four-part comic adaptation of The Lost World: Jurassic Park, published by Topps Comics in July 1997, confirmed to readers that a cartoon series based on the film was in development. In November 1997, it was reported that the cartoon would be accompanied by Jurassic Park: Chaos Effect, a series of dinosaur toys produced by Kenner and based on a premise that scientists had created dinosaur hybrids consisting of DNA from different creatures. The new toys were based on the upcoming cartoon. That month, it was also reported that the cartoon could be ready by March 1998, as a mid-season replacement. The Chaos Effect toyline was released in June 1998, but the animated series was never produced, for unknown reasons. When the first film was released in 1993, two different video game publishers were given the rights to publish games based on it, Sega and Ocean Software. Both produced several different games based on the film for several different game systems, including the NES and Sega Genesis. In 1994, Ocean Software produced a sequel to the first game in the series for the Game Boy and SNES systems. Universal Interactive also produced an interactive game for the ill-fated 3DO system. For the second film in the franchise, DreamWorks Interactive released five games for the most popular systems at the time. The third film had the biggest marketing push, spawning seven video games for PC and Game Boy Advance. A number of lightgun arcade games were also released for all three films. Trespasser is a "digital sequel" to the 1997 film The Lost World: Jurassic Park. The player assumes the role of Anne who is the sole survivor of a plane crash on InGen's "Site B" one year after the events of the film. It was released 1998 for PC. Jurassic Park: Operation Genesis is a tycoon-style video game. The objective of the game is to fulfill Hammond's dream of building a five-star theme park with dinosaurs. It was released 2003 for the Xbox, PlayStation 2 and PC. Jurassic Park: The Game is an episodic video game based on the Jurassic Park franchise, bridging the story of the first two films developed by Telltale Games in a deal with Universal. It was released on November 15, 2011 to a mixed reception, with reviewers praising the story but criticizing the characters and gameplay. [clarification needed] The game takes place during and after the events of the original film, and follows a new group of survivors trying to escape Isla Nublar. The game features several creatures from the film, as well as new additions like Troodon and a Tylosaurus. The game is available on PC, Mac, PlayStation 3, Xbox 360, and iPad. Lego Jurassic World is a 2015 Lego action-adventure video game developed by Traveller's Tales and published by Warner Bros. Interactive Entertainment, for the PlayStation 4, PlayStation 3, PlayStation Vita, Nintendo 3DS, Wii U, Xbox One, Xbox 360, and Microsoft Windows. It followed the plots of the series' four films, including Jurassic Park, and was released on June 12, 2015. Jurassic World Evolution is a business simulation game developed and published by Frontier Developments, and released on June 12, 2018. The game tasks players with constructing and managing their own Jurassic World theme park. The game features the series' fictional Muertes Archipelago, including Isla Nublar and Isla Sorna. On June 21, 1996, Universal Studios Hollywood opened Jurassic Park: The Ride. Universal Studios Japan later opened this attraction, and Universal's Islands of Adventure opened Jurassic Park River Adventure. The rides are heavily themed on the first three films. Another ride based on the series has also been opened at Universal Studios Singapore (Jurassic Park Rapids Adventure). In 2018, Universal Studios Hollywood announced that their version of Jurassic Park: The Ride would close to make way for a newly themed Jurassic World ride, which is set to open in summer of 2019. ^ a b c As described in the novels. ^ As described in the films, Jurassic Park and The Lost World: Jurassic Park. ^ Shaffer, R.L. (October 25, 2011). "Jurassic Park: Ultimate Trilogy Blu-ray Review". IGN. Retrieved May 22, 2018. ^ "Jurassic Park Re-release". The Hollywood Reporter. Universal. Retrieved June 8, 2012. ^ Acuna, Kirsten (June 14, 2015). "'Jurassic World' is the first movie ever to crack $500 million in its opening weekend". Business Insider. Retrieved January 31, 2018. ^ Ginnekin, Van. "Screening Difference: How Hollywood's Blockbuster Films Imagine Race". p. 11. Retrieved January 24, 2017. ^ Kirk H. Beetz, Beacham's Encyclopedia of Popular Fiction: biography & resources (Beacham Pub., 1996), 2238. ^ Nigel Morris, The Cinema of Steven Spielberg: Empire of Light (Wallflower Press, 2007), 249. ^ Ken Gelder, Popular Fiction: The Logics and Practices of a Literary Field (Routledge, 2004), 113. ^ a b c "Jurassic Park". MichaelCrichton.com. Retrieved January 1, 2009. ^ Michael Crichton (2001). Michael Crichton on the Jurassic Park Phenomenon (DVD). Universal. ^ Appelo, Tim (December 7, 1990). "Leaping Lizards". Entertainment Weekly. Retrieved February 17, 2007. ^ Jurassic Park – Movie Reviews, Trailers, Pictures – Rotten Tomatoes. Rottentomatoes.com. Retrieved on 2012-09-04. ^ "Jurassic Park (1993)". Box Office Mojo. ^ The Lost World. MichaelCrichton.com. Retrieved on 2012-09-04. ^ "The Lost World Jurassic Park (1997)". British Film Institute. Retrieved July 7, 2007. ^ "The Evolution of Claire (Jurassic World)". PenguinRandomhouse.com. Retrieved March 15, 2019. ^ Squires, John (April 9, 2018). "Check Out Cover and Synopsis for 'Jurassic World' Prequel Novel 'The Evolution of Claire'". Bloody Disgusting. Retrieved March 15, 2019. ^ "'Jurassic Park' to be re-released in 3D". NME. March 17, 2012. Retrieved November 25, 2012. ^ Rich, Katey (March 16, 2012). "Jurassic Park 3D Coming To Theaters In July 2013". Cinema Blend. Retrieved November 25, 2012. ^ Armitage, Hugh (March 16, 2012). "'Jurassic Park 3D' coming in 2013". Digital Spy. Retrieved November 25, 2012. ^ The Making of Jurassic Park III (DVD). Universal Pictures. 2005. ^ Ryan, Tim (August 25, 2000). "Cameras roll soon for Jurassic Park III". Honolulu Star-Bulletin. Archived from the original on October 18, 2000. ^ "Jurassic Park III production notes: Dinos Everywhere". CinemaReview.com. Retrieved April 27, 2016. ^ "Jurassic Park III (2001)". Rotten Tomatoes. ^ "Jurassic Park IV Update:". TheZReview.co.uk. June 12, 2002. Archived from the original on November 2, 2002. ^ Linder, Brian (November 7, 2002). "Jurassic Park IV Goes Ahead". IGN. Retrieved December 10, 2014. ^ McNary, Dave; Diorio, Carl (December 22, 2002). "Early-bird specials". Variety. Retrieved December 10, 2014. ^ "Jurassic IV Draft Done". Sci Fi Wire. July 13, 2003. Archived from the original on July 27, 2003. ^ "More on JPIV". IGN.com. January 30, 2003. Retrieved December 10, 2014. ^ "Jurassic Park 4 plot details?". MovieWeb.com. January 31, 2003. Retrieved December 10, 2014. ^ a b Davidson, Paul (July 11, 2003). "Sam Neill Confirms Jurassic Park IV". IGN.com. Retrieved December 10, 2014. ^ "Jurass Park Quattro – Guess who will be back!". AintItCool.com. September 19, 2003. Archived from the original on April 1, 2004. ^ Knightly in Boxoffice via "Knightley Confirms JP4 Talks?". CountingDown.com. July 14, 2003. Archived from the original on July 3, 2004. There were actually two roles in 'Jurassic Park IV' Steven thought I might fit. First there was the granddaughter part, which wasn't all that big a role; she was only in it at the beginning. The other part he was considering for me was substantially larger, but I won't go into any details in case I make Steven angry (laughs). ... I truly don't know if I'll end up getting either part or not. The script is pretty much locked down, but I think they're still working on final drafts at the moment. ^ Otto, Jeff. "Exclusive Interview with John Sayles". Reelz.com. Archived from the original on December 14, 2014. Retrieved December 10, 2014. ^ Franklin, Garth (May 12, 2004). "News Bites: Wednesday, May 12th 2004". DarkHorizons.com. Archived from the original on September 24, 2014. Retrieved December 10, 2014. ^ Moriarty (August 17, 2004). "AICN Exclusive!! Moriarty's Been to 'Jurassic Park 4' and Returns to Tell the Tale!!". AintItCool.com. Archived from the original on February 6, 2005. ^ Bruder, Jessica (May 30, 2005). "Sayles' people". The New York Observer. Archived from the original on September 23, 2014. ^ Goldberg, Matt (October 12, 2012). "Check out the Humanosaurus Concept Art for Scrapped Jurassic Park 4 Script". Collider. Retrieved December 10, 2014. ^ "Humanosaurus, a cross between human being and dinosaur". Stan Winston School of Character Arts. June 24, 2015. Archived from the original on August 7, 2015. Retrieved August 8, 2015. Image: conceptual artwork by creature designer Carlos Huante for JURASSIC PARK 4, drawn early in project's development. ^ "Jack Horner on the state of Jurassic Park 4!!!". AintItCool.com. January 28, 2006. Retrieved December 10, 2014. ^ "Frank Marshall On Eight Below, Indy IV and Jurassic Park". Empire. April 2006. Archived from the original on July 8, 2006. ^ Holleran, Scott (June 24, 2006). "Interview: Producer and Director Frank Marshall". Box Office Mojo. Archived from the original on August 13, 2006. ^ "'Jurassic Park IV' News". Collider.com. April 5, 2007. Archived from the original on August 10, 2014. ^ Paul Davidson (February 21, 2006). "Jurassic Park IV Script Ready". IGN. Retrieved December 10, 2014. ^ Douglas, Edward (December 6, 2007). "Frank Marshall on Indy 4... and Bourne 4???". ComingSoon.com. Archived from the original on December 8, 2007. ^ Porsa, Dan (October 16, 2013). "Talking OLDBOY With Mark Protosevich at NYCC". This is Infamous. Archived from the original on November 6, 2014. Retrieved December 10, 2014. ^ Bettinger, Brendan (n.d.). "'Rise of the Planet of the Apes' Writers Rick Jaffa and Amanda Silver to Script 'Jurassic Park 4". Collider.com. Archived from the original on March 4, 2013. Retrieved August 20, 2013. ^ "Jurassic Park 4 Gets a Director (Hint: It's Not Steven Spielberg)". E! Online. Retrieved March 15, 2013. ^ "Jurassic Park 4 to be directed by Colin Trevorrow". March 15, 2013 – via www.bbc.co.uk. ^ "Steven Spielberg's 'Jurassic World' to Hit Theaters in June 2015". TheWrap. September 10, 2013. Retrieved August 5, 2014. ^ "Exclusive: Jurassic Park 4 Targeted for 2015, to be Shot in 3D". Retrieved July 1, 2013. ^ "'Jurassic Park 4' Titled 'Jurassic World'; Gets Summer 2015 Release Date". Screenrant.com. Retrieved August 5, 2014. ^ "'Jurassic World' Director Offers Filming Details and Confirms Returning Character". Screenrant.com. Retrieved August 5, 2014. ^ "Totally Laime". Elizabeth Laime. September 19, 2014. Retrieved September 19, 2014. ^ Gross, Rachel E. (June 16, 2016). "How Impossible, Actually, Is the Dinosaur DNA Splicing in Jurassic World?". Slate. Retrieved November 3, 2016. ^ "See the Indominus Rex roar in Jurassic World now..." universalpichomeent.tumblr.com. Retrieved July 29, 2018. ^ Karmali, Luke (August 13, 2015). "Jurassic World Sequel Opening in UK Cinemas Before US". IGN. Retrieved August 27, 2015. ^ a b c Rebecca Ford (July 23, 2015). "'Jurassic World 2' Set for 2018". The Hollywood Reporter. (Prometheus Global Media). Retrieved July 24, 2015. ^ a b "Colin Trevorrow Talks Jurassic World 2 and More! (Surprise Guest: J.A. Bayona!)". Jurassic Outpost. September 30, 2016. Retrieved September 30, 2016. ^ a b "Jurassic World: Fallen Kingdom–Production Information" (PDF). Universal Pictures. May 2018. pp. 1–3. Retrieved June 26, 2018. ^ a b Weintraub, Steve (June 13, 2015). "Jurassic World: Colin Trevorrow Talks Building a Foundation for Future Installments". Collider.com. 4:30–7:58. Retrieved June 13, 2015. ^ a b Phil de Semlyen (April 23, 2014). "Exclusive: Jurassic World Sequels Planned". Empire. Retrieved May 31, 2015. ^ "Colin Trevorrow Not Directing the Next Jurassic Park Film". ComingSoon.net. May 31, 2015. Retrieved May 31, 2015. ^ Masters, Kim (June 15, 2016). "Steven Spielberg, Kathleen Kennedy and Frank Marshall on How to Win in Hollywood Today". The Hollywood Reporter. Retrieved June 18, 2016. ^ Trumbore, Dave (February 24, 2017). "'Untitled Jurassic World Sequel' Officially Starts Filming". Collider. Retrieved February 24, 2017. ^ Bayona, JA (July 8, 2017). "This is a wrap for Jurassic World: Fallen Kingdom! What a journey! Thank you to everyone that made it possible!". Twitter. Retrieved July 9, 2017. ^ Han, Angie (September 21, 2015). "Which 'Jurassic Park' Quote Inspired 'Jurassic World'? Which One Will Inspire 'Jurassic World 2'?". Slashfilm. Retrieved October 21, 2015. ^ "Frank Marshall Interview - Jurassic World (Jurassic Cast ep 22)". YouTube.com. Jurassic Cast Podcast. October 19, 2015. 2:35–3:09. Retrieved October 21, 2015. ^ McClintock, Pamela; Masters, Kim (November 4, 2015). "Studio Chiefs Unleashed: 6 Top Execs Spar Over Gender Pay, Sony Hack and 'Star Wars' Box Office". The Hollywood Reporter. Retrieved November 5, 2015. ^ Douglas, Edward (September 10, 2016). "Exclusive: Jurassic World Confirmed as a Trilogy". LRM Online. ^ Anderton, Ethan (December 27, 2017). "'Jurassic World: Fallen Kingdom' Isn't a Retread of 'The Lost World', Will Set Up 'Jurassic World 3'". /Film. Retrieved December 29, 2017. ^ Scott, Ryan (March 24, 2017). "Laura Dern Wants to Return in Final Jurassic World Sequel". MovieWeb. Retrieved March 25, 2017. ^ "Jurassic World 3 will be released June 11, 2021". Jurassic World Facebook page. February 21, 2018. Retrieved December 4, 2018. ^ Squires, John (February 21, 2018). "Life Continues to Find a Way as 'Jurassic World 3' is Already Dated for Release!". Bloody Disgusting. Retrieved March 30, 2018. Variety is reporting that Jurassic World 3, which surely won't actually be the official title, will be hitting theaters on June 11, 2021, three years after Fallen Kingdom. ^ "Universal launches plans for third 'Jurassic World' film". ABC. Associated Press. February 21, 2018. Retrieved February 21, 2018. ^ Kroll, Justin (February 21, 2018). "'Jurassic World 3' to Hit Theaters in June 2021". Variety. Retrieved February 21, 2018. ^ Romano, Nick (February 21, 2018). "Jurassic World 3 rampaging toward 2021 release date". Entertainment Weekly. Retrieved February 21, 2018. ^ Stack, Tim (March 30, 2018). "Steven Spielberg confirms Colin Trevorrow will direct third Jurassic World". Entertainment Weekly. Retrieved March 30, 2018. ^ a b c d Stack, Tim (April 18, 2018). "Jurassic World 3 will be a 'science thriller,' says Colin Trevorrow". Entertainment Weekly. Retrieved April 18, 2018. ^ a b "Exclusive: Colin Trevorrow Shares His Experiences with 'Fallen Kingdom' + Talks Hopes for 'Jurassic World 3'". Jurassic Outpost. December 13, 2018. Retrieved December 18, 2018. ^ Lussier, Germain (March 23, 2018). "Meet Emily Carmichael, the Next Big Name in Scifi and Fantasy Filmmaking". Gizmodo. Retrieved December 18, 2018. Next up was a gig writing a remake of The Black Hole for Disney. Trevorrow was so impressed with that, as well as with Carmichael's work on Pacific Rim Uprising, he brought her on to help him write Jurassic World 3. ^ Holmes, Adam (May 7, 2018). "Jurassic World 3 Won't Include Any Hybrid Dinosaurs". CinemaBlend. Retrieved May 8, 2018. ^ a b c Stack, Tim (June 22, 2018). "Jurassic World: Colin Trevorrow answers Fallen Kingdom burning questions". Entertainment Weekly. Retrieved December 4, 2018. ^ a b c d Sciretta, Peter (June 26, 2018). "Exclusive: Colin Trevorrow Explains the 'Jurassic World: Fallen Kingdom' Ending, Teases Where 'Jurassic World 3' Will Go". /Film. Retrieved December 4, 2018. ^ a b c Travis, Ben; De Semlyen, Nick (July 3, 2018). "18 Jurassic World: Fallen Kingdom Secrets from JA Bayona and Colin Trevorrow". Empire. Retrieved December 4, 2018. ^ Anderton, Ethan (December 14, 2018). "Sorry, But 'Jurassic World 3' Won't Have Dinosaurs Attacking Cities". /Film. Retrieved December 18, 2018. ^ Williams, Owen (December 17, 2018). "Colin Trevorrow Says Jurassic World 3 Won't Be A Dino-War Movie". Empire. Retrieved December 18, 2018. ^ Lussier, Germain (June 25, 2018). "The Makers of Jurassic World: Fallen Kingdom Solve Some of the Film's Biggest Mysteries". io9. Retrieved December 4, 2018. ^ El-Mahmoud, Sarah (October 2018). "Bryce Dallas Howard Is All-In On Original Characters Returning In Jurassic World 3". CinemaBlend. Retrieved December 4, 2018. ^ Scott, Ryan (February 20, 2019). "Jurassic World Short Is Coming to Theaters with Hobbs & Shaw". MovieWeb. Retrieved February 21, 2019. ^ a b "New LEGO Jurassic World DVD film 'The Indominus Escape' releasing in October!". Jurassic Outpost. August 28, 2016. ^ Sciretta, Peter (October 10, 2016). "Watch The Animated 'Jurassic World' Prequel Short Film 'LEGO Jurassic World: The Indominus Escape'". /Film. Retrieved June 24, 2017. ^ "Lego Jurassic World: The Indominus Escape (2016)". Rotten Tomatoes. Retrieved June 24, 2017. ^ "Lego Jurassic World - Employee Safety Video". British Board of Film Classification. ^ a b Rayne, Elizabeth (November 8, 2018). "Jurassic World animated prequel finds a way in LEGO Jurassic World: The Secret Exhibit". Syfy Wire. Retrieved December 2, 2018. ^ a b Maglio, Tony (November 30, 2018). "Ratings: NBC's 'LEGO Jurassic World' Special Sinks Like a Brick". SFGate. Retrieved December 2, 2018. ^ Weiss, Josh (February 15, 2019). "Development: LEGO announces Jurassic World miniseries; Jumanji 3 starts shooting; and more". Syfy Wire. Retrieved February 16, 2019. ^ Pearson, Ben (February 15, 2019). "LEGO Announces New 'Jurassic World' Prequel Mini-Series and Toy Sets". /Film. Retrieved February 16, 2019. ^ Bayona, JA (December 29, 2016). "Excited to announce that my longtime collaborator @BernatVilaplana will be the editor for the new Jurassic film". Twitter. Retrieved December 29, 2016. ^ "Film Releases". Variety. Retrieved February 22, 2018. ^ "Jurassic Park (1993)". Box Office Mojo. Retrieved August 31, 2012. ^ "The Lost World: Jurassic Park (1997)". Box Office Mojo. Retrieved August 31, 2012. ^ "Jurassic Park III (2001)". Box Office Mojo. Retrieved August 31, 2012. ^ "Jurassic World (2015)". Box Office Mojo. Retrieved August 2, 2015. ^ "Jurassic World: Fallen Kingdom (2018)". Box Office Mojo. Retrieved October 20, 2018. ^ "Jurassic Park Movies at the Box Office". Box Office Mojo. Retrieved October 20, 2018. ^ "Jurassic Park (1993)". Rotten Tomatoes. ^ "Jurassic Park Reviews". Metacritic. ^ a b c d e "Cinemascore". cinemascore.com. ^ "The Lost World - Jurassic Park(1997)". Rotten Tomatoes. ^ "The Lost World: Jurassic Park Reviews". Metacritic. ^ "Jurassic Park III Reviews". Metacritic. ^ "Jurassic World (2015)". Rotten Tomatoes. ^ "Jurassic World Reviews". Metacritic. ^ "Jurassic World: Fallen Kingdom (2018)". Rotten Tomatoes. ^ "Jurassic World: Fallen Kingdom Reviews". Metacritic. ^ "Jurassic Park Comic Books". GamePro. July 1993. p. 39. Retrieved October 19, 2016. ^ Johnston, Rich (July 22, 2016). "Jurassic World comes to comics". Bleeding Cool. Retrieved August 2, 2016. ^ "Weekly Buyer's Guide - 1/18/11". IGN. January 18, 2011. Retrieved December 2, 2018. ^ Norris, Erik (February 3, 2011). "Jurassic Park: The Devils in the Desert #2 Review". IGN. Retrieved December 2, 2018. ^ Norris, Erik (March 10, 2011). "Jurassic Park: Devils in the Desert #3 Review". IGN. Retrieved December 2, 2018. ^ Norris, Erik (April 7, 2011). "Jurassic Park: Devils in the Desert #4 Review". IGN. Retrieved December 2, 2018. ^ a b c "'Jurassic' series?". The San Bernardino Sun. June 17, 1993. Retrieved December 20, 2016. ^ Pugh, Chris (June 1, 2016). "Escape from Jurassic Park – 1993 animated series detailed". JurassicOutpost.com. Retrieved July 3, 2016. ^ Squires, John (December 6, 2016). "Art and Story Details from Cancelled 'Jurassic Park' Animated Series Finally Surface". Bloody Disgusting. Retrieved December 6, 2016. ^ Scott, Ryan (December 6, 2016). "Canceled Jurassic Park Animated Series Full Season Details Revealed". MovieWeb. Retrieved December 6, 2016. ^ Pugh, Chris (December 5, 2016). "The Entire First Season of the Cancelled Jurassic Park Television Series Revealed (Exclusive)". Jurassic Outpost. Retrieved December 6, 2016. ^ a b Stout, William (April 26, 2014). "My Top Ten Favorite Dinosaur Films – Part One". WilliamStout.com. Retrieved June 25, 2015. ^ Duffy, Mike (July 15, 1993). "Dinosaur TV 'toons are extinct for now". The Indianapolis Star. Retrieved December 20, 2016. ^ Finkelstein, Dan (July 20, 1997). "What's New". Dan's The Lost World Page. Archived from the original on June 3, 2000. ^ Finkelstein, Dan (July 22, 1997). "What's New". Dan's The Lost World Page. Archived from the original on June 3, 2000. ^ a b c Finkelstein, Dan (November 11, 1997). "Chaos Effect". Dan's The Lost World Page. Archived from the original on September 9, 1999. ^ a b "Chaos Effect". JPToys.com. Retrieved June 25, 2015. ^ "Interview With Tim Bradley". JPToys.com. March 1, 2008. Retrieved June 25, 2015. ^ Kollar, Phil (June 8, 2010). "Telltale Creating Episodic Jurassic Park Game". GameInformer.com. Retrieved June 8, 2010. ^ O'Brien, Lucy (March 29, 2018). "Jurassic World Evolution Gets Official Digital, Physical Release Date: Life finds a way on June 12 and July 3". IGN. Retrieved April 19, 2018. ^ Kimmelman, Ruben (December 12, 2018). "'Jurassic Park,' 'The Shining,' And 23 Other Movies Added To National Film Registry". NPR. Retrieved December 18, 2018.